I’m fine, no really! Ok who am I trying to fool? 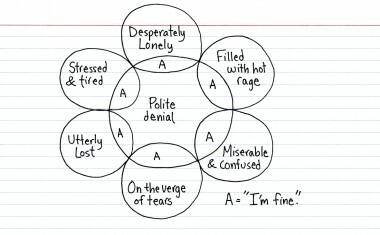 I’m fine… no really I am! OK who am I trying to fool? I’m not OK, but why should I be? After performing the saddest duty of life I don’t expect to be fine, and the reality is that I am experiencing every single one of the emotions depicted in the image above. Sometimes one at a time, sometimes several at once, and occasionally feeling every one of them simultaneously, and it’s perfectly bloody normal, even if it doesn’t feel normal. I’m struggling, that’s the truth, but I’d be more worried about myself if I wasn’t struggling. The hardest part about struggling is the reality that those that I love are struggling too. There’s no escaping it, but it’s hard to give on an empty tank, it’s hard to see them hurt and not be able to do what is needed for them. I’ve written before on social conventions and the dance that goes on around asking someone how they are.. and I’ve lost count of the amount of times in the past weeks that I’ve answered “I’m fine” to a question… when I really wanted to yell and scream and rally against the inequities of life..
I’ve been reflecting on how prepared people are to hear the truth…. what would they do if I hit them with the truth? As tough as it is to ride this wave of emotion at the moment, I know enough to know it’s normal, I know enough to know that it too will pass (although it will never go away, our love for Samuel was so strong that the pain will always be there to some degree), I know that I love my family, and my family is tough … we’ve dealt with a lot, and we always bounce back. I know that I am and we are resilient and we will get through. I know enough to not be afraid to cry.… and to let the tears flow….